Select whether CDT-generated makefile should be used or custom one. Select internal or external builder (for generated makefile only). Change the default build command (for external builder or for custom makefile). Configure how the CDT handles make errors. Map the target passed to make when you select build or rebuild. In the C/C++ Projects view, right-click your project, and select Properties. Select C/C++ Build from the list. To stop the build when an error is encountered, select Stop on first build error. To use the default make command, select the Use Default check box. To use a build utility other than the default make command Build Command box, clear the Use Default check box . To build your project when resources are saved and change the default make build target, select the Build on resource save (Auto Build) check box. Enter a new build target in the Make build target box. 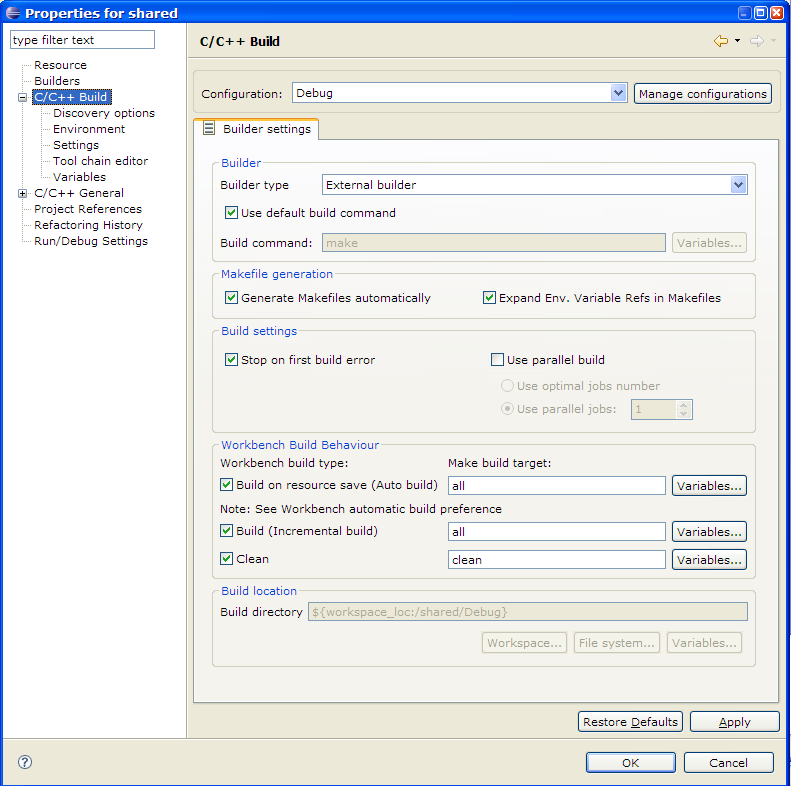 To change the build default make build target, select the Build (Incremental Build) check box. Enter a new build target in the Make build target box. To change the rebuild default make build target, select the Rebuild (Full Build) check box. Enter a new build target in the Make build target box.